Through the brightness of Saint Lucia, light and hope are celebrated on Santa Lucia Day. This holiday marks the longest night of the year, as well the beginning of the Christmas season in Sweden and many other countries. Light, on this long dark night, is celebrated. 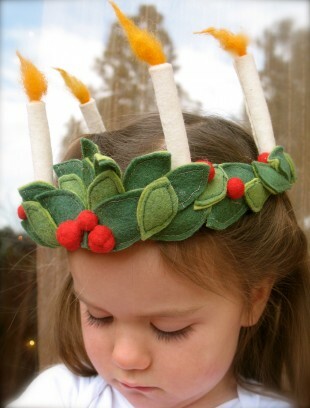 Traditionally children walk in gowns of white, with evergreen wreaths atop their heads, singing songs with lit candles. with lit candles, the children were breathtaking. Thank you Santa Lucia for reminding us to carry our light, in our hands and in our hearts. You might also like my post on how to make your own felt mushroom house. Beautiful! You always bring a special touch to your creations. This is beautiful! How did you make it? Thank you Charlene. I made a crown out of willow. I then wrapped cotton ribbon around that. I made the red felt balls from a wet-felting technique and the green leaves were cut from felt sheets and then these were sewn on to the crown. Hope that helps. This is such a gorgeous crown! How did you make the candles? I cut a rectangle out of a sheet of white felt and rolled it into a cylinder shape, then glued in in place with a hot glue gun. Next, I put red wool felt roving into the opening in the top of the cylinder, shaped it, and glued it in place.